Block polymers, which are two or more polymer chains with different properties linked together, show great promise for many of these applications, and a research group at the University of Delaware has made significant strides in their development over the past several years. “We are using synthesis, processing and characterization methods that are robust and widely applicable, with an eye toward scaling these methods to facilitate the future industrial adoption of block polymers,” says Thomas H. Epps, III, who leads the group. Epps, who is the Thomas and Kipp Gutshall Professor of Chemical and Biomolecular Engineering and professor of Materials Science and Engineering at UD, and two of his graduate students, Melody Morris and Thomas Gartner, recently published an article highlighting this work in Macromolecular Chemistry and Physics. The piece was a “Talent” submission, a unique article type dedicated to young scientists. The article highlights the Epps group’s work aimed at tuning and characterizing block polymers in bulk and thin film geometries. The group has leveraged expertise in polymer chemistry, polymer physics, chemical engineering and materials science to manipulate the phase behavior, thermal transitions and mechanical and transport properties of block polymers to optimize materials design. “Our goal was to show how a truly multidisciplinary approach can help solve problems in the development of next-generation materials — a development that requires simultaneous consideration of structure, properties and processing,” Epps says. He points to battery technologies as an example. Battery membranes, and the associated electrolytes, used to enable ion transport for energy storage and generation applications can offer high performance in terms of rapid charging, long lifespan and minimal self-discharge. However, these benefits often are accompanied by safety — for example, explosion and fire — and environmental concerns. One approach the Epps group is taking is the use of nanoscale structures to improve both device performance and processing. To do this, they have developed high-throughput and combinatorial computational methods that allow nanoscale structures to be visualized with relatively low-cost optical techniques. “Basically, this approach enables us to minimize the number of samples that need to be measured with expensive techniques such as atomic force microscopy and transmission electron microscopy,” Epps says. The group also has developed universal design rules — that is, those that are applicable to a number of different types of surfaces and polymers — to understand key factors that link surface characteristics to nanostructure formation. “These rules enable us to predict which polymers will work well with which surfaces, so, for example, we can create self-cleaning coatings that can resist fingerprint smudges on touchscreens,” Epps says. Epps is also leading an effort to do nanoscale patterning with block polymers as a low-cost alternative to lithographic approaches currently used to make electronic devices. “With all of this work, I think the things that set us apart are the universal approaches, the inclusion of joint experiment and theory efforts, and our unique focus on combined chemistry, physics, and processing knowledge to accelerate materials design,” he says. The article, “Tuning Block Polymer Structure, Properties, and Processability for the Design of Efficient Nanostructured Materials Systems,” was co-authored by Melody A. Morris, Thomas E. Gartner, III, and Thomas H. Epps, III. 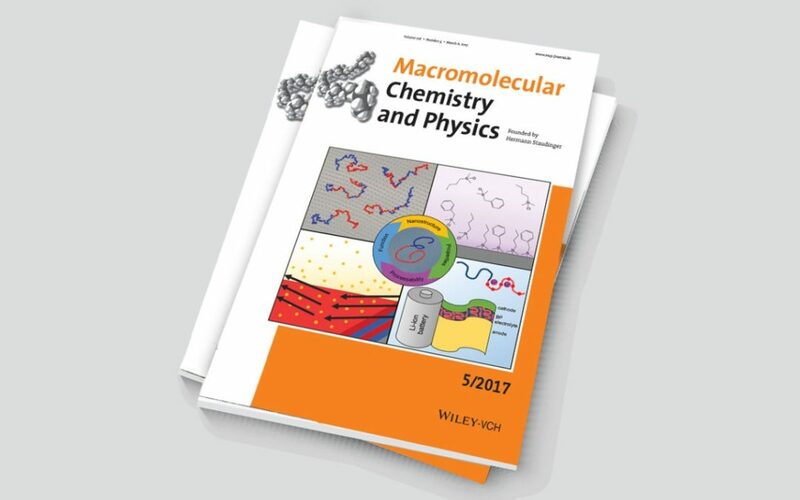 It was published online in Macromolecular Chemistry and Physics on Jan. 24, 2017, and is the cover article in the print edition of the journal. The work was partially funded by Department of Energy Basic Energy Sciences grant DE-SC0014458, the University of Delaware Paul H. Schipper Fellowship, and National Science Foundation grant DMR-1610134.